Add swagger to your home with this dapper adjustable stool. Wooden seat with gray metal base has riveting industrial style. An air of sophistication incarnates itself through the curvature of the legs. 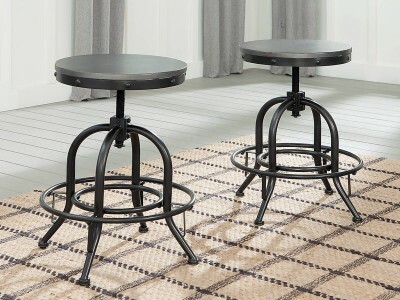 This good-looker smoothly moves from counter to pub height, giving you and your guests the freedom to sit comfortably. Rest your feet on the sturdy circular footrest, and you’re good to go.